Pop darling Anne-Marie is preparing to roll out her debut album, Speak Your Mind, later this year. The 26-year-old is currently racking up impressive streams on her Marshmello-assisted single “FRIENDS.” With more than 2.5 million daily listens, it is sitting comfortably within the top 10 on Spotify’s Global Top 50 chart and is shaping up to be an international hit. It and several other songs she has unveiled over the last two years including her breakout single “Alarm” will be included on her LP’s tracklist when it drops April 27. 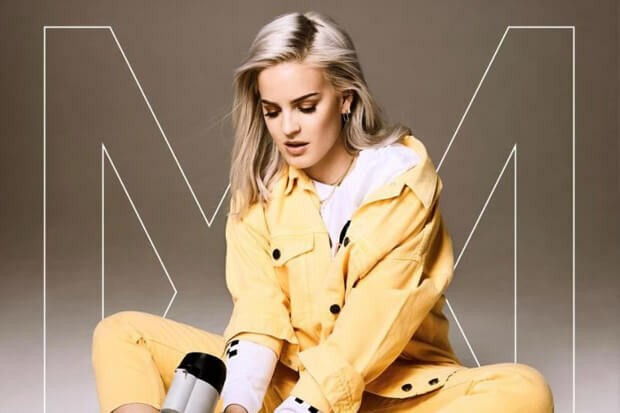 Speak Your Mind has been described as a labor of love for Anne-Marie. The standard edition includes 12 releases including new songs such as “Perfect,” “Trigger” and “2002.” The former was written in collaboration with Ed Sheeran and has been described as an ode to an old crush, while “Perfect” is a self-love anthem. The LP includes writing credits from the likes of Emily Warren who has written extensively with The Chainsmokers as well as production credits from Steve Mac, Nana Rogues and Marshmello. The hitmaker announced the album’s imminent release today (February 23) and shared its cover shoot. On it, she is a vision in creamy yellow with a megaphone in hand. The project could not come at a better time, either. Later this spring, Anne-Marie is set to embark on Sheeran’s Eurpoean tour providing plenty of promotional opportunities. Check out the full album cover and tracklist below! SPEAK YOUR MIND. 27.04.18. PRE ORDER NOW. Are you ready for the album? Let us know below, or by hitting us up on Facebook and Twitter!